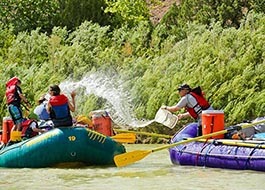 Winding through a remarkable wilderness of twisted mountains, dramatic cliffs, and towering plateaus carved by an ancient inland sea, the Desolation Canyon Green River rafting trip is a journey for the ages. 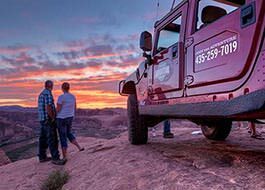 A spectacular scenic flight from Moab, Utah lands you atop a dramatic desert plateau where your Utah rafting adventure begins. You'll surrender your senses to nature as you're enveloped by 40 million years of geologic history. 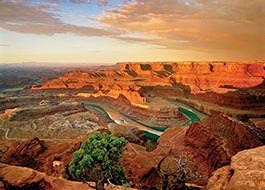 Explore Utah's famous outlaw hideouts, ancient dinosaur habitats, and Fremont Native American petroglyphs. Discover the thrill of Green River whitewater. More moderate rapids on this section of the Green River allow you to experience paddling a 2-person inflatable kayak or relax in an oar boat while Western's guides take you down river. Comfortable summer water temperatures and over 60 fun-filled rapids make this Desolation Canyon trip the ideal getaway for your next adventure. 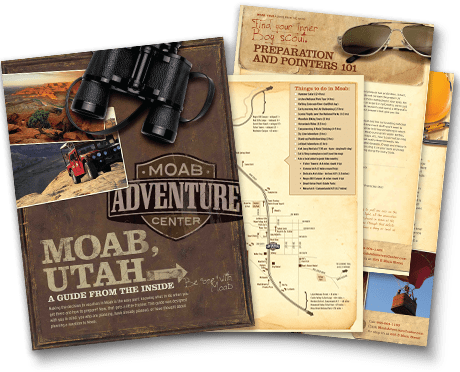 Your guides in Desolation Canyon will navigate you safely through, cook delicious riverside meals that satisfy and delight, lead a hike with a spring in their step, help you pitch a tent if it looks like rain, encourage you to stay up late under the stars, and help make a craft with the kiddos. Desolation Canyon is virtually made for catering to all the fun a five year old wants, everything thrilling the teenagers want, and the mellow relaxation the parents and grandparents want. Family Magic happens on rafting trips because time is spent, experiences are shared, and memories are made together in a way that rarely happens on any other kind of vacation. Besides a spectacular geological display, Desolation Canyon also displays a bounty of unique human history. Ever heard of Butch Cassidy and the Hole in the Wall Gang? 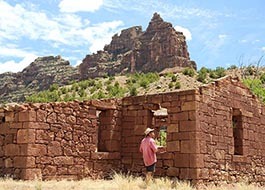 Desolation Canyon was one of many "holes in the wall" where they eluded lawmen in southern Utah. Evidence of the settlers, moonshiners, and ranchers that aided them remain in the canyon as tokens of an era gone by. Great guides, and strong leaders. Also felt safe. Noticed great community of people. Loved the light touches of history which added a lot to my trip. I loved the kayaking option. Daniel added a lot to the trip. Thank you for offering this class 2-3 level trip - my daughter enjoyed it without getting scared. 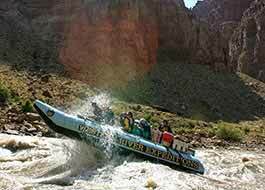 If you have not yet made the Desolation Canyon, Green River Trip with Western River Expeditions you cannot have enjoyed the best holidays of your life. The indescribable beauty of the canyons, our wonderful guides, the kindness of the other guests, the perfect organization of the trip and - last but not least - the fantastic meals. 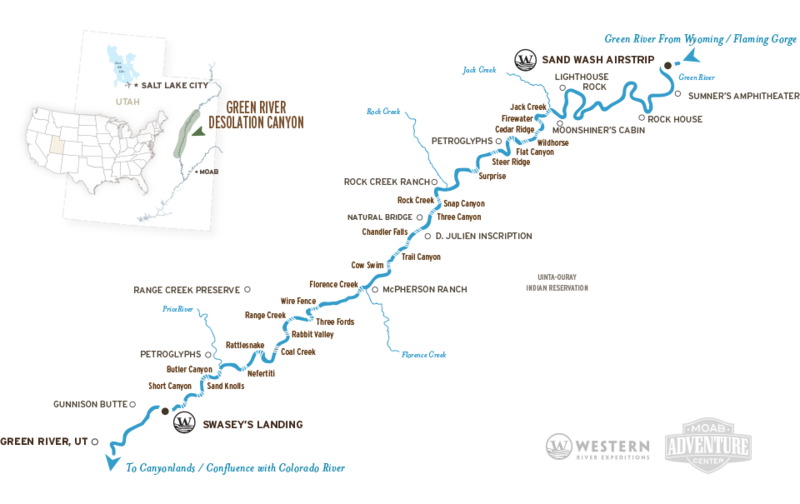 "An experience of a lifetime" promises the brochure of Western River. This is just half the truth, because the reality is pure magic.